Routledge. Paperback. GOOD. Spine creases, wear to binding and pages from reading. May contain limited notes, underlining or highlighting that does affect the text. Possible ex library copy, thatâll have the markings and stickers associated from the library. Accessories such as CD, codes, toys, may not be included. Routledge, 2000. Paperback. Good. Disclaimer:A copy that has been read, but remains in clean condition. All pages are intact, and the cover is intact. The spine may show signs of wear. Pages can include limited notes and highlighting, and the copy can include previous owner inscriptions. At ThriftBooks, our motto is: Read More, Spend Less.Dust jacket quality is not guaranteed. Routledge, 2000. Paperback. Very Good. Disclaimer:A copy that has been read, but remains in excellent condition. Pages are intact and are not marred by notes or highlighting, but may contain a neat previous owner name. The spine remains undamaged. At ThriftBooks, our motto is: Read More, Spend Less.Dust jacket quality is not guaranteed. Routledge, 2000. Paperback. Acceptable. Disclaimer:A readable copy. All pages are intact, and the cover is intact. Pages can include considerable notes-in pen or highlighter-but the notes cannot obscure the text. At ThriftBooks, our motto is: Read More, Spend Less.Dust jacket quality is not guaranteed. Longman. Used - Good. Shows some signs of wear, and may have some markings on the inside. New York: Longman, PEARSON EDUCATION. Very Good. 1991. 1st Ed. paperback. 5x8". VERY GOOD Condition, PAPERBACK...some faded yellow hilighting; Yellow spine & cover titles on black paper covers. Close up photo hitler portrait cover art. 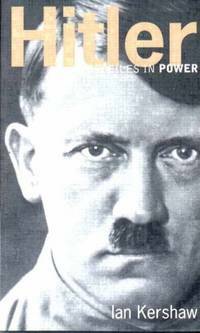 ; adolph hitler cover phot from DAILY NEWS; 230pg pages; WAR LEADER Adolf Hitler has left a lasting mark on the twentieth-century, as the dictator of Germany and instigator of a genocidal war, culminating in the ruin of much of Europe and the globe. 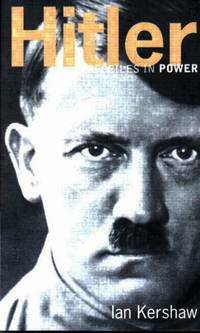 This innovative best-seller explores the nature and mechanics of Hitler's power, and how he used it. .
Longmans, 1991. This is an ex-library book and may have the usual library/used-book markings inside.This book has soft covers. In poor condition, suitable as a reading copy. 2000-08-03. Good. Ships with Tracking Number! INTERNATIONAL WORLDWIDE Shipping available. May not contain Access Codes or Supplements. May be ex-library. Shipping & Handling by region. Buy with confidence, excellent customer service! Routledge. PAPERBACK. 0582437563 Like New Condition. . Fine. Routledge, 2000-08-17. Paperback. New. As new clean tight and bright Please email for photos. Routledge. PAPERBACK. 0582437563 Brand New, printed in english , Ready to ship, fast delivery (6-8 busienss days ) worldwide . New.